Karaoke Contest Entries Up: Vote Now! 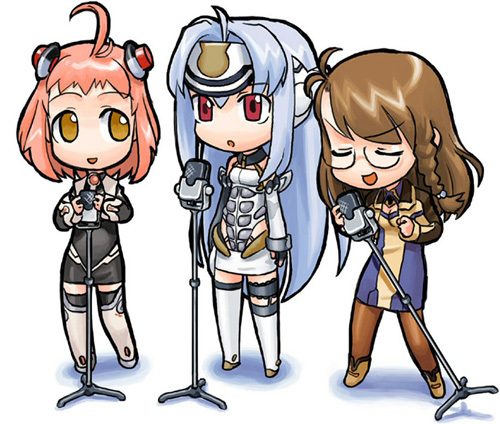 The karaoke contest deadline passed, was extended, and has passed again, so now it’s time to vote on the best entries! I received quite a bit of last minute entries, so I’m glad that I extended the deadline. I’m really happy with all of the entries that were submitted. I had to double check some of the entries to make sure they were actually karaoke, and not the original (seriously!). Thanks to everyone who entered. You’re all winners in my book! Title: LoveLoveLove no Sei na no yo! You can download all of the entries as a compressed rar, or get them via bittorrent. I have tons of bandwidth, but I figured I should try and do the bittorrent thing to conserve anyway. SJ submitted a karaoke version of Fly Me To The Moon. While technically, the song was in an anime, I don’t really consider it an anime song in the spirit of this contest. He went to the trouble of entering though, so I’ll post it, but it won’t be in the running. I tried linking to the websites of the entrants when I knew their urls. If you entered and you’d like a link to your website, email me and let me know so I can add a link to your blog or whatever. Voting starts right now and ends at midnight on January 1st (or whenever I remember to end the voting), so vote early! The winners will be finalized and prizes will be sent! Thanks again to everyone who took the time to record an entry. For the most part, the quality of the songs were above anything I had ever expected. Good luck to all the entrants! LOL. Ok I am torrenting them now. Its impossible to play them straight from the site. I felt so lonely singing Ichigo Complete with out the five girls. OMG. Okay I regret submitting now. Standards are too high. It’s unfair that girls can sing high pitched songs so easily while guys have to struggle like hell. And MrLostMan sounds like the guy in Bartender OP. I think I would go with either Karin or Atashi ..
How about you … where’s your song? How come u did’t sing too? Yeah Karin sounds moe moe. Lol. Hung sang already dude, it’s in the first karaoke post. Just finished listening and voting. That was great guys! I also think everyone did a fantastic job, Naddie in particular, because of the cool double voices *o*!! My heartful rendition of Anata ga Mori Ita. And you can vote on the sidebar. And I guess that you could technically vote for yourself, though that would be kinda lame. I voted for Karin. She’s the best by far , lovely singing 🙂 Who’s she? I like Kaika’s song even though it’s the first time I heard it (I haven’t seen Star Ocean EX). I do not see SJ’s entry of Fly Me to the Moon for voting? I’m with you, LianYL-san, why did mama give me a throaty voice? unfair indeed, lol. I bet my friends won’t even vote for me. I just don’t hold a candle to the competition. I really butchered the song… BADLY, lol. My apology to Coolon (original artist/group). My vote go for the underdog, I actually enjoy TJ Han-san’s Ichino Complete! I bet the little Mashimaro figurines were actually singing with you, the damn computer just couldn’t record it. gotta bt the songs now! How come my entry’s not there Hung…sent you an email already. NOOOOO! I was going to vote for SJ. It was so melodious. Mr.Lostman it is, then. I may be a bit biased as the name made me want to vote for him right away. Shuichiro did a great job on his entry, though. It’s just a shame that it had no backtrack. However, it was just about at the point where it wasn’t necessary. Very good voice. Lang: Oops, my spam filter ate your entry. I’ve added it to the site and the poll. Sorry about that! Just voted. I try as much as possible to sound in tune. Sometimes it’s so hard when your voice is so low. Really hard to sing those high notes. Thanks to Hung for hosting this Karaoke Contest. I didn’t even know they had karaoke contests at AnimeSuki forums, and thanks for the tutorial on how to record your voice with the karaoke track that helped alot. Hey, how did some of you remove the static in the background when you recorded your voices? I narrowed it down to Atashi and Karin, and using the formula of who would I choose to repeat next, Atashi got my vote. A bit surprised that the guys did not choose to sing the more ‘manly’ songs like SRW~OG-DW’s OP or classics like SBYamato’s OP. You’re guys, guys. Play to our strengths. Waii, the entries are up! 😀 I think I’m gonna get the torrent, since everyone did a pretty good job! It’s amazing how no two persons had duplicate entries, too. ..while everyone clearly did their best, I think there’s a huge gap between how Karin and everyone else performs! Sounds pretty professional and the only reason I downloaded the .rar was because I wanted Karin’s mp3 .. I’d probably even have bought her cd! Ok I listened to all the songs. Karin is bullying us kids lol. I also liked Fly me to the Moon albeit it being Frank Sinatra’s version haha. I am surprised, and regret not entering now, next time I have to do something. Wow, that’s 5 very good renditions! Shuichiro’s singing isn’t bad, but the lyrics are wrong. And I think LianYL didn’t sing “Reverse”, either, or I would have voted for him. Thanks for the comments about my song, people 😀 I had lots of different takes but had to content myself with the final one since my blocked nose refuse to cooperate anymore xD I cringe listening back to it now, eheh. Wow, everyone did so good! Right from the first song I was impressed, lol. Oh well, I did it in the spirit of karaoke fun, so xD; I’m down to two people (lol, I think everyone have more or less the same two people now) and it’s kinda hard deciding. hung, can I still submit even thogh it’s over the deadline? Also guys, don’t try to sing high notes. Trust me. It’ll end up funny. I voted ProxyM, but the winning ones are doing well too. Maybe I should have sent in my awful attempt at Tori no Uta instead to garner gag votes. Finally voted (I voted for Ten :D). @Jewelray: You should definitely do a duet of Daichi no la-li-la 🙂 I’d love to listen to it. There are different feelings when you actually listen to a duet instead of just your own voices attempting a duet, lol. ^Maybe I’ll do it for animesuki’s duet competition… if I can convince my sister to sing with me (you’re right, duets are more fun when you are actually singing with someone else ^_^) Although, I might go with a song by Rythem… they have a lot of great duets also. I finally voted. Hee. Awesome entries, btw. If I had no shame before, I am growing one now. XD Anyhow, I really am starting to fangirl over a few entries. Loved Naddie. Really loved Kaika. And I am definitely fangirling over Shuichiro. I love it when dudes “can” sing. Some people can’t pronounce Japanese words right, they sound funny. Some people have very nasal voices. It’s quite sad. I like the one who did the DNAngel cover. It sounded very natural and props for her for having a sleek clean recording. Others would’ve sounded nicer if they had a better recording, esp. when their head tones were weak.